How does a glacier melt underwater? Sea Level Rise: How far, how fast? A Sea-Ice Free Arctic in 2016? I’m a bit late jumping on this bandwagon, but here is my first attempt to explain my research simply. The explanation behind this was a cartoon from the well-known web comic xkcd, describing the Saturn V moon rocket using only the ten hundred most commonly used words. It has since become something of a web phenomenon, especially amongst scientists (for example look up the #upgoer5 hashtag on twitter). To give due credit, I put this together using the text editor handily made available by Theo Sanderson. I study the way ice and water are changing at the top of the world. My work uses a very big computer which makes lots of attempts to tell us what the world will be like in one or two hundred years at the top of the world. We want to know how much ice there will be, how much ice will turn into water and how warm the air will get and how quickly this will all happen so that we can be ready for changes in the water around the land. One of the other things I have been working on is a picture of the ice in the place called green land, which is a piece of land near the top of the world. Every day this picture is changed to show how much ice has fallen from the sky and how much ice has changed into water. You can see this picture here. The idea of this blog is to describe some of the things I have been working on to a non-technical audience (I’m envisioning my grandmother here – though I suspect my parents are actually the only people who read this blog). Some of the things I work on are (I hope) potentially important and useful data products for business, planners and public alike, other things are pure research. In any case much of what I do is funded directly or indirectly by people who pay taxes so I feel it is equally important that the people who pay for it also understand it. This is not always as straightforward as I hope it is and in this post I explore one of the difficulties I have in communicating my science. Some years ago, I was having a hair cut and chatting to the hairdresser (as you do), when she asked me what I did for a living. I explained I was studying for a PhD in glaciology. Bearing in mind I hadn’t the least idea what PhD actually was until I became a student myself, I then said that I basically studied how glaciers moved (close enough). Her next question completely stumped me. I had taken for granted that she would know what a glacier is but as I later realised, there is no reason that she would or should. She had never visited the alps or gone skiing or hiking in the mountains (the most obvious way to come into contact with glaciers) and she was certainly not a budding geography student. Glaciers never featured in my school curriculum, so why would they have done in hers? I had immediately fallen over one aspect of the Dunning-Kruger Effect, where you assume others have an equivalent understanding of the same things you do. The other, more well known aspect of the Dunning-Kruger Effect is illusory superiority, where individuals commonly rate their intelligence, skills etc as above average. I still find it difficult to know what kind of level to aim for when discussing my work. I truly believe everyone should be able to understand the principles and the concepts behind what I do and if it sounds too complex to understand then I am not communicating it well enough. At the same time I have to recognise that a 4 year degree, a 1 year masters and a 3 and a half year PhD plus 4 years of post-doc work have inevitably shaped my thinking and the ‘stuff what I know’; my (non-technical) audience does not have that advantage. My greatest fear is that I am patronising or boring the people I am talking to and repeating tired or obvious metaphors. The interest with which people usually react when I explain what I do for a living suggests that there is a great latent interest in climate and glaciers but I often then feel hamstrung about going further than a few superficial comments. Navigating the Scylla and Charybdis of science communication is a major reason I started this blog, so I am posting this shortish piece now by way of an explanation and an apology in advance for when I get it wrong. Following the dictum that the world needs a new blog like I need a chocolate biscuit I would like to discuss some things that are not commonly discussed elsewhere on the web, and in particular my own work in glaciology. As for the answer I finally gave to the inquisitive hairdresser? Well a glacier is like a very slow moving frozen river. Snow falls at the top is pressed down by more snow falling on top and becomes ice, this very very slowly starts to flow downhill like very slow moving water until it gets to the end of the glacier where it melts. A Svalbard Field Journal, part 1. This is a piece about field work I did in Svalbard in 2010. I’m not sure it really belongs here, but I hope it is interesting to read about what Arctic fieldwork is really like. I have been tremendously lucky to have had several opportunities to work in the Arctic, but as I hope this makes clear, it’s quite often a big slog with uncertain outcomes. The sun rises early in March in Svalbard but it is not yet hitting the town, we are before the Solfest in Longyearbyen, and I am lying in bed alternately wishing I could sleep longer and being hugely excited at the prospect of getting out in the field again. With the light comes the cold, it is -26C outside with a fresh wind and some light snow falling, not brilliant weather for fieldwork. I am 12 weeks pregnant and the nausea comes early and remains all day but I hope the cold dry air on the glacier will help. In spite of that, I know my fieldwork opportunities will likely significantly reduce when the baby arrives so I’m determined to do one last big trip. Down at UNIS (the university centre on Svalbard), our boxes are already packed with equipment, we just need to get them on the sledges, pick up our snowscooters and go. This is prime fieldwork and study time and the logistics centre is bustling with students, excited to be out on their first trip, and the long-termers getting ready to set up experiments. I’ve already got my scooter gear sorted out, huge padded suit, enormous padded boots, crash helmet, thin woollen undergloves, leather gauntlets, neoprene face mask. It feels a bit ridiculous inside but I know I’ll need it later on the scooter and the glacier. Packing a sledge is an artform, one which, over the course of the week, I will gradually start to master, but for now I’m pretty useless and just try and hold stuff when asked and keep out the way while my colleague C gets on with showing me how it’s done. Finally, we’re off, later, as usual, than we’d wanted, but all the kit is with us and we’re making good time. Our route intially lies up Adventdalen (named for the old whaler Adventure which explored this area). In summer this is a more-or less impassable morass of braided streams, gravel, mud and silt, glacially scoured rocks brought down by an ever shifting river. When the cold comes, and the river and the soil freeze, and then the snow falls, this is the main highway out of town. We follow a long straight line of multiple overlaid scooter trails; riding a scooter is like riding a motorbike, fast, loud and exciting. I get up to 80km/h on the straight, in spite of towing a trailer, and wonder vaguely if the foetus can feel the vibrations. I thank UNIS silently for having such good kit, the heated handlebars of the scooter are essential, and in spite of the boots my feet are already getting chilly, I remember to wiggle my toes to keep them warm and, as we peel away from the main trails and slowly motor up ever narrower valleys and gullies, I lift my goggles momentarily to allow the frozen condensation on the inside to clear. We are heading to Tellbreen (breen meaning the glacier in Norwegian, the “tell” in question being, I suspect, William Tell), a small and rather unimportant glacier about an hour and a half from Longyearbyen. A number of small and unrelated projects are going on there this year and there is a weather station lower down that we will be using. We will be working very high up on the glacier near the col at the top where the glacier divides in two. It falls fairly steeply down from this point and I struggle to get the scooter with the trailer up. I realise too late I haven’t given it enough power and there is a slow inevitable deceleration as the scooter digs itself into the soft snow. Fresh soft snow on a slope is the hardest for a scooter to deal with and I have just made the classic mistake. I determine not to make it worse and wait for my colleague C to return with the spade. You don’t drive anywhere in Svalbard without a spade. It’s not a bad dig-in and within half an hour we’re finally at the top of the glacier. C and a student came out in late Autumn and put two tarpaulins on the glacier surface. These will be the baselines for our experiments. Their positions marked with 2m long bamboo canes. Very little of the canes are showing through the snow and it takes us a while to locate them. The wind is getting fresher and blowing snow through the pass, we are in an incredibly exposed position and I am even more thankful for UNIS equipment. Our first task is to dig a work trench. This will give us protection from the wind but will also be where we stick our temperature sensors into the snow. We will be placing two large water canisters in the snow pack and letting the water, with a dye added, drip through the snow and refreeze. 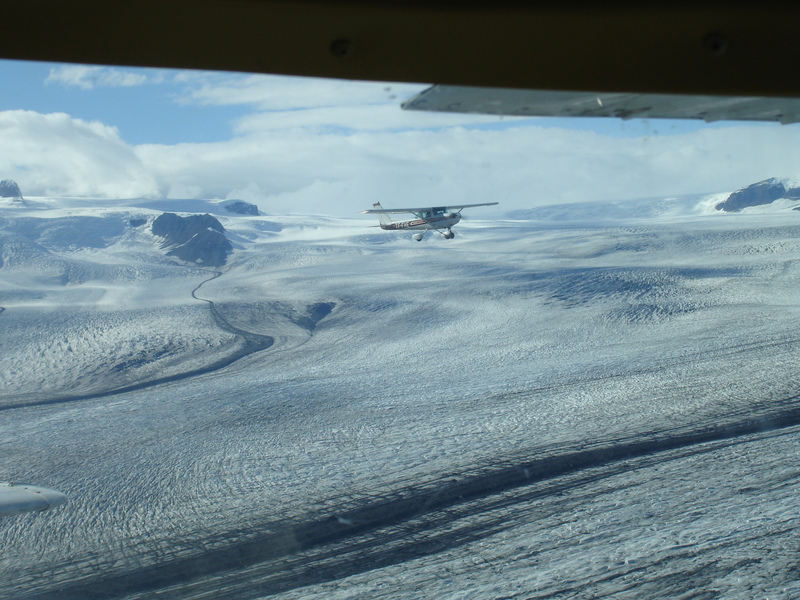 At the second site the canister will be directly on the glacier surface. The temperature sensors will record the effect the water has on the snow temperature at different depths. At the end of the experiments we will dig through the snow to find the ice, record how far it has run and how thick it is. The dye will tell us on which day the water ran through. It sounds like a simple and very esoteric set of experiments, but it is actually intended to help us shed light on a very difficult problem. Most of the glaciers in the Arctic melt, at least partly, in summer, but the water does not run off, it refreezes in the snow or on the surface of the glacier, forming superimposed ice. It is almost impossible to distinguish superimposed ice from normal glacier ice remotely so while we can measure melt directly by satellite, we have little idea how much of it remains on the glacier and how much is lost to the ocean. 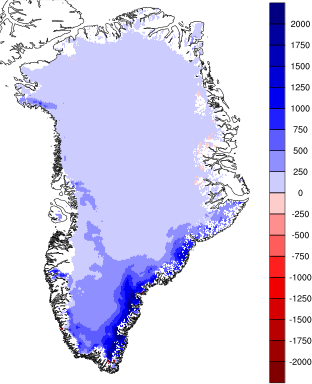 The GRACE and GOCE missions give us another way to measure mass loss over large regions but for climate models like the one I run in Denmark, where we make future projections of glaciated regions, we still need to factor this in. The work C and I are engaged in is aimed at developing an approximation we can put into the model to take this into account. In Antarctica the problem doesn’t occur as most of the glaciers there don’t melt. We have brought a snow blower with us to plough the snow away and it is making short work of the trench, there is still a lot of digging to do though, and I reflect that whenever I am in the Arctic I seem to find myself doing a lot of digging either for latrine pits, to examine glacier sediments or to clear snow. At the Greenland ice core sites high up on the ice sheet, famously the first thing you’re given when you arrive is a spade. I try and cut some blocks of snow to use as a wall against the wind but the snow is too soft and my efforts are only partly successful. Thankfully though, C had thought to bring some wide boards and we use these to cover the trench so we can work sheltered from the howling wind. It has taken us almost all day to dig the trench and the hole for the first water canister. Now it’s starting to get dark and we really need to leave before driving down the glacier gets too hazardous. We hurriedly stick the sensors in the snow pack, I’ll have to measure the spacings accurately tomorrow, fill the canister with dye and warm(ish) water and open the tap to a dripping position. As the wind gets even stronger we cover over the trench as far as we can, gather our stuff, shouting at each other to be heard over the wind and get out of there. By the time we’re off the glacier it’s almost completely dark and I am grateful for the strong headlights on the scooter, even so it’s a much slower trip back as we carefully try to avoid the rocks and hard ice chunks that litter the track. I am exhausted with the work and the fatigue of early pregnancy, but high as a kite with the successful completion of the work we’ve managed today – I wasn’t sure we’d manage as much as we did. Tomorrow we do the second experiment, but for now it’s time for a beer (for C) and an orange juice a big plate of chips and a hamburger in the pub for me. I had barely managed to eat anything all day, it’s too cold and I simply wasn’t hungry enough to attempt it. I am extremely thirsty, the work was physical and sweaty, but in the cold you don’t feel the thirst, and I always forget to drink. I fall into bed at 10pm, ready to do it all over again tomorrow. Posted on 2 January , 2013 2 January , 2013 Categories People, Places, Snow and ice, Weather and climateLeave a comment on A Svalbard Field Journal, part 1. I am writing this from a hospital bed in Copenhagen. At this time of year it is commonplace to make some resolutions about how we want our lives to be changed, whether weight loss, reduction in alcohol or giving up smoking. Conventional wisdom has it that we should tell other people of our intentions to make it harder for us to fail. In any case, it has not been my habit to make resolutions at new year, since I prefer to evaluate my life and try to make adjustments as I go on. In fact I think I once read that the beginning of spring was a better time to make resolutions. However, this year I plan to make an exception. In fact I have made two resolutions this year and this blog post encapsulates both. There are all sorts of grim lists available on the Internet based on how many germs or bacteria we get contact with every day. In fact, it seems to me that it is an amazing testament to the immune system that we aren’t ill more often. However, watching the medical staff taking such high precautions with hygiene, and seeing how ill some of the children on this ward are is more than enough to convince me. My first resolution is that this year I am going to wash my hands properly. That is, will wash them thoroughly, regularly and with proper soap. More than that, I will make sure the rest of the sterns family do too. My second resolution can also be summed up in this blog. I started it with all sorts of bold ambitions, but it all too quickly became a millstone, or else a way to avoid doing “real writing” of papers. It is however painfully clear to me I really need to get over my mental block, and cultivate writing as a habit. My second, much more difficult resolution is thus to write something, anything, for at least 10 minutes every day of the year. Some of those ramblings will never see the light of day. Some will be professional and used for publications and others will end up being posted here. So see this as my statement of intent. I will not post every day or perhaps even every week, but the main thing will be to force myself to the keyboard. This blog may not ever see a lot of posts, but it will be my sounding board and practice page, comments more than welcome. I hope you feel like coming along for the ride.